Age-related Macular Degeneration (AMD) is the most common cause of blindness in the US, and is most common in patients over the age of 60 (although it can occur earlier in life). 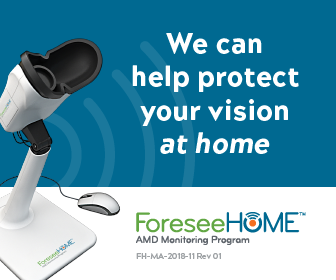 There are currently more than 11 million people suffering from AMD, and this number will rise as the general population ages. 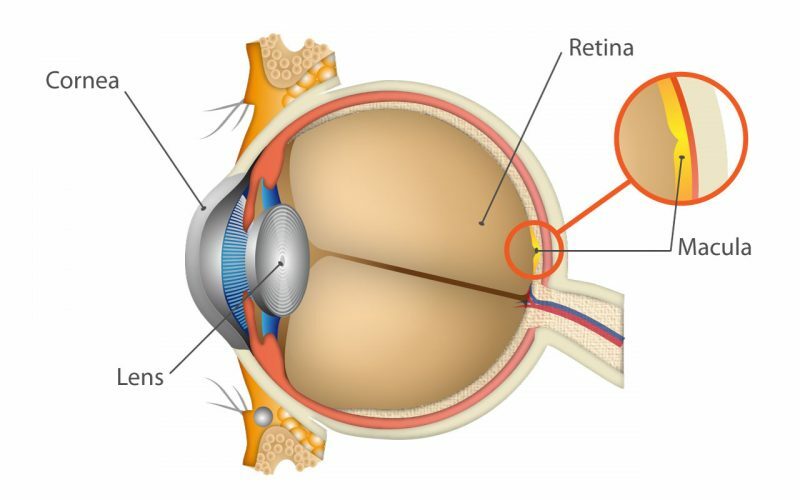 The macula is the part of the retina responsible for sharp, central vision used when you look directly at someone’s face for example. AMD damages this part of the eye, resulting in loss of detailed vision. Side vision (also called peripheral vision) is normally unaffected, and it may be possible to use the remaining side vision to perform some tasks. There are two types of AMD – “Dry” AMD (also known as atrophic AMD), and “Wet” AMD (also known as exudative AMD). Dry AMD (which makes up 90% of cases) is characterized by a gradual thinning of the macula, and the appearance of spots on the retina called drusen. These drusen are deposits of waste material that the eye is unable to dispose of, and their development is a sign that the Dry AMD is progressing. Dry AMD usually develops slowly, and causes dimming of central vision (noticeable when reading for instance. Wet AMD progresses from the dry form in about 10% of cases, and occurs when the eye, sensing that damage is occurring, forms new blood vessels under the retina. These abnormal new vessels leak into the retina, causing significant damage resulting in a large blind spot in the central vision. The wet form of AMD progresses much more quickly than the dry form, and can result in much more severe vision loss. Risk factors for AMD can be divided into two categories – Non-modifiable (ones you cannot change) and Modifiable (ones you can change). Non-modifiable risk factors include age, genetics (family history of the disease), gender (women are at slightly increased risk), ethnicity (Caucasians have an elevated risk, although it can affect any race), and existing disease (AMD in one eye increases the risk of it developing in the other eye). Modifiable risk factors include smoking (both current and former smokers are at a significantly higher risk than non-smokers, especially if there is also family history), obesity, high blood pressure, exercise (low cardiovascular fitness and a sedentary lifestyle increase risk), and diet/nutrition. There is currently no treatment available for Dry AMD. Addressing the modifiable risk factors (e.g. stopping smoking, exercising, increasing your intake of the right kind of foods) can reduce the risk of developing AMD, and also reduce the risk of progression to the wet form of the disease. There is significant evidence that specific nutrients, vitamins and minerals can reduce risk – the AREDS and AREDS 2 studies showed a significant reduction of risk of progression of AMD using certain anti-oxidants, and research performed since then has identified which anti-oxidants are most important for the protection of the eye. Within the retina, a layer called the Macular Pigment protects the eye from high energy visible light, and (along with other vitamins and minerals) acts as a powerful anti-oxidant to reduce oxidative stress and provide protection to the retina.